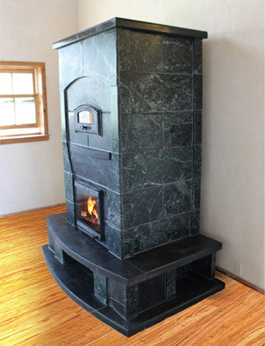 Greenstone Soapstone Masonry Heaters use a labyrinth of core heat exchange chambers to capture the energy of an efficient, clean-burning fire in its stone mass, and radiate that heat evenly over many hours, resulting in the world’s most comfortable homes. 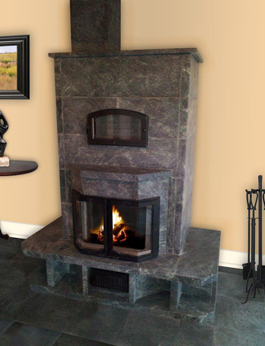 These radiant fireplaces are the only American made soapstone heaters, featuring soapstone from Schyler, Virginia, a time test source of some of the world’s best heat retaining material. All of our models can be skinned in a wide range of fieldstone, flagstone and brick veneers, allowing you a one of a kind heater design. 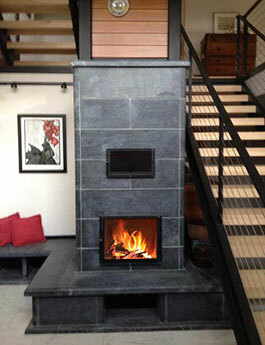 On average, our soapstone masonry heaters reduce the amount of wood burned to heat a home by 60 to 80 percent. You really can heat your home with one or two small fires per day.  Our technical skill and hands-on approach has led to scores a happy customers across North America. Our integrated Water Coil Heat Exchangers are a great way to heat the spaces furthest from your masonry heater, using in-floor and in-wall radiant heat. Now single masonry heater can truly be a whole-home heating system, transporting heated water to the spaces that do not have a line of sight to the heater. Our team can guide you through the process of the overall system design and will coordinate with your builder and plumber to ensure a seamless process. Modern controllers even allow you to integrate your masonry heater’s water coil heat exchanger with domestic hot water, solar panel and geothermal systems, creating a single smart off-the-grid heating system. – Weight: 8,000 to 9,700+ LBS. – Weight: 7,800 to 9,400+ LBS. – Weight: 4,250 to 6,300+ LBS. – Weight: 5,200 to 6,500+ LBS. – Weight: 6,750 to 8,250 LBS. – Weight: 4,250 to 4,850+ LBS. 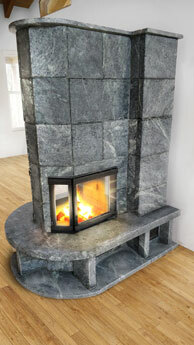 We started with a line of five soapstone masonry heater models and have grown to over one hundred unique soapstone wood stove designs incorporating various bench designs, mantels, bake ovens, cook tops and a variety of soapstone color combinations, surface finishes and edge details. Our integrated water coil, heat exchanger allows our customers to warm the areas of their home furthest from the masonry heater and even heat their domestic hot water. Our soapstone stoves and masonry heaters have been featured in some of America’s most sustainably built, off-the-grid homes. When the US Fish and Wildlife Service needed a sustainable, clean, wood burning radiant heater for the Wildlife Refuge Visitor Center, they turned to Greenstone and our Vitoria 7 masonry heater, featuring Alberene soapstone from Virginia. 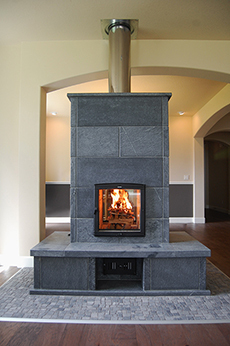 If you are looking for a masonry heater, soapstone fireplace, soapstone stove, or masonry fireplace, Greenstone has the premier green, renewable, carbon neutral heating source you can find. 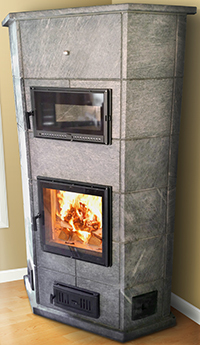 A masonry heater is also known as a soapstone fireplace, soapstone stove, Russian fireplace, heat-retaining fireplace, ceramic stove, tile stove, contra-flow stove, Finnish stove, Swedish stove or kachelofen. Now these are not all the same device but do share the central design feature of thermal mass heat capturing, radiant warmth. For too many years, Americans have allowed the majority of the heat produced by their stoves and fireplaces to escape up the chimney. Today it is our mission to stop the waste and clean the air, and we are proud to have introduced hundreds of families across the United States to a better wood heat. Call or email us today to discuss the ideal masonry heating system for your home.